During the first few weeks of school, we’ve spent a lot of time working on identifying nouns and distinguishing between common and proper nouns. My directions were simple since this was the first time using Wordle with my students. Students had to type the word “noun” five times which then made it larger than any other words on the poster. They had to include 5 proper nouns and 10 common nouns. Ideally, the words were supposed to be related to the Olympics which we have been learning about, but a few other nouns snuck in there it seems. They then got to play with the layout and font to make it their own. 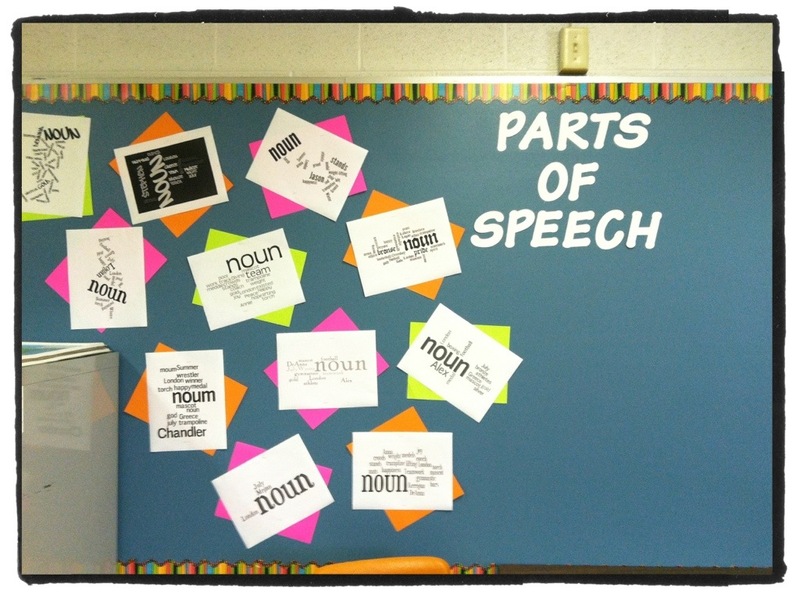 In the coming weeks, we will add other parts of speech. Have students type their list in Word first so that they can spell check and save their list in case of technical difficulties. Our filter was blocking Wordle on some computers which was a little frustrating. I had to send some of their word lists to myself through Edmodo and make a few posters on my classroom computer. We don’t have color printer capabilities for the students so I had to add my own brightly colored paper to the bulletin board. I am excited for them to see their work on display when they come to class today. I’ve used Wordle in classes for several years and students love it. This is an interesting twist on it, though. Thanks for the idea. Another great word cloud program you might like is tagxedo.com. It allows you to form a shape out of your word cloud. I will have to check it out! Thanks for the tip! In what ways do you use Wordle?